Right now gray seems to be the hottest color, from bedrooms to bathrooms, we can't seem to get enough. It's calming and moody, and can be used as a neutral or for drama. Gray's versatility and universal appeal make it the color of the moment and a perfect choice for a kitchen makeover. 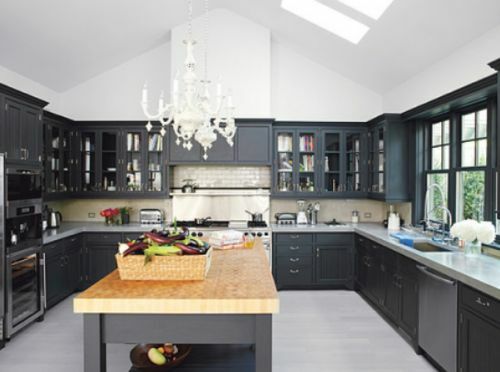 Gray floor to ceiling cabinetry wrap this kitchen up in a cozy cloak of warmth. A simple gray island in the middle is just enough to turn up the color appeal in this space. 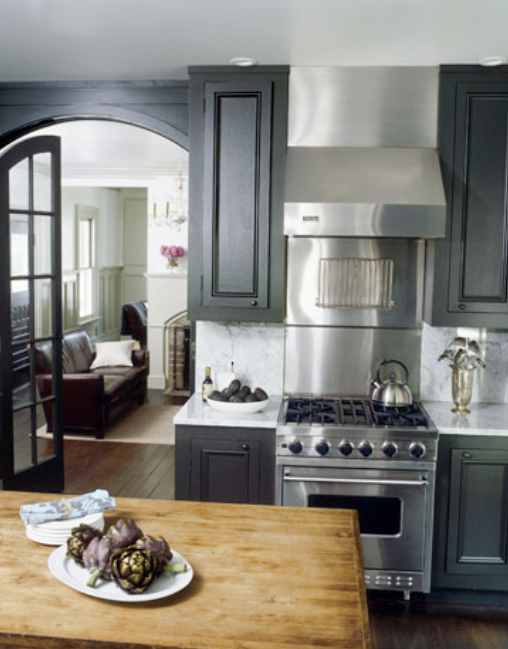 Gray mixed with whites and woods, arches and doorways, makes for a beautiful weathered look. I'm loving gray in home decor now. That and the light blues. I wish I could mix gray in my home decor but it wouldn't look right. :( When I can redo everything I'm going to go for light blue and gray tones. Thanks for sharing. gray is one of my forever favorites. i hadn't thought of using it in a kitchen but it really works well in virtually any room. I love grays. When we moved into our home (October will make three years), I had the kitchen painted Bunny Gray (love, love, love this shade of gray). It's calming and chic. Great post! Grey is so fabulous anywhere! I love slate...we just redid our bathroom and used a slate floor, I'm totally in love! Enter my giveaway- I'm giving away an amazing hair straightener! I feel like i could cook all day in that first kitchen. Cos its just that lovely. Gray are great, they goes well easily. The top photo was my inspiration! My husband and I just bought our first house (open concept) and we've gone with a gray theme(various shades) pretty much throughout the entire house and I'm LOVING it! Gray has been a love of mine for years, it's funny to see it sooo popular now. Both of these rooms are amazing, you always show the best of the best! I was inspired the other week in a dressing room at abercrombie. Gray painted beadboard chunky crisp white crown molding and base boards with beautiful slate tile floors. So I decided im going to paint my kitchen gray. Thanks for the post! Just made me want to paint even more! I love gray walls! We painted our whole interior gray. Kitchen, family room, bedrooms, etc. It's much warmer than plain white and makes a nice blank canvas for art work, photos and furniture. I have some interior pics posted on my blog of our kitchen, family room and entryway-ALL GRAY! Wow. Love all those kitchens. I'm pretty sure I already have the first image saved but now I need the other two! LOVE grey. Agreed! I painted one dark gray wall in my kitchen last summer and I love it! Especially against the white of the baseboards. I am having a give away for US and Canadian readers this week, so join in! I am loving that last kitchen!! Love the stove! And the flowers in the background! oh I do love that kitchen! 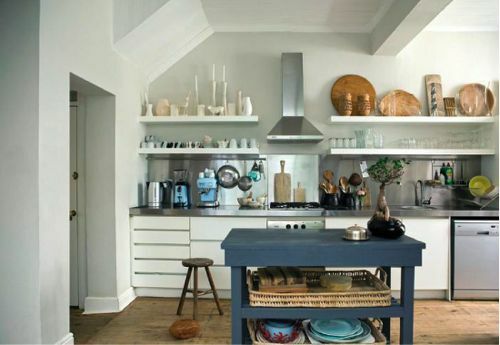 Love the stove and the splashback and also the open shelves but then I am in "kitchen mode" at present! I don't think I could ever tire of grey! It's one of those neutrals that is too pretty... lovely inspiration here— the wood and marble look so perfect with the grey!